Materials: Bigleaf maple vessel with border of veneer laminate (ebony-rosewood-maple-rosewood-ebony). Vessel top and feet of Brazilian rosewood (feet are reinforced with a backing of black wood-fiber veneer). 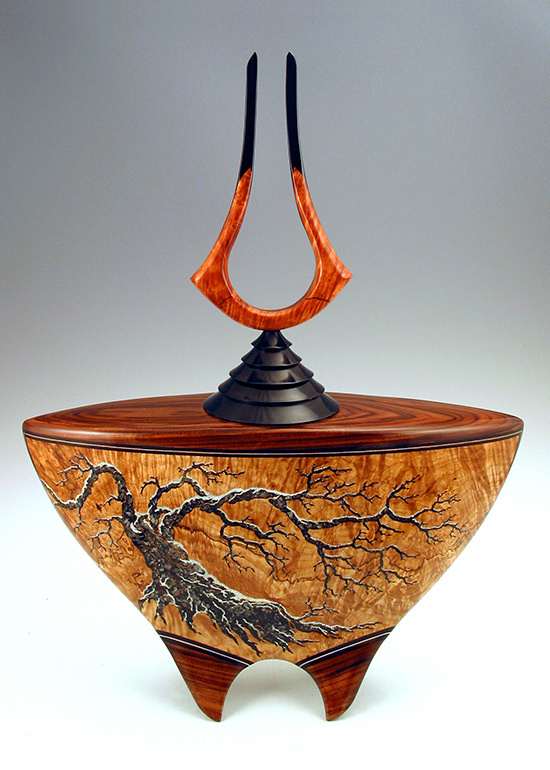 Vessel lid of laminated African ebony. 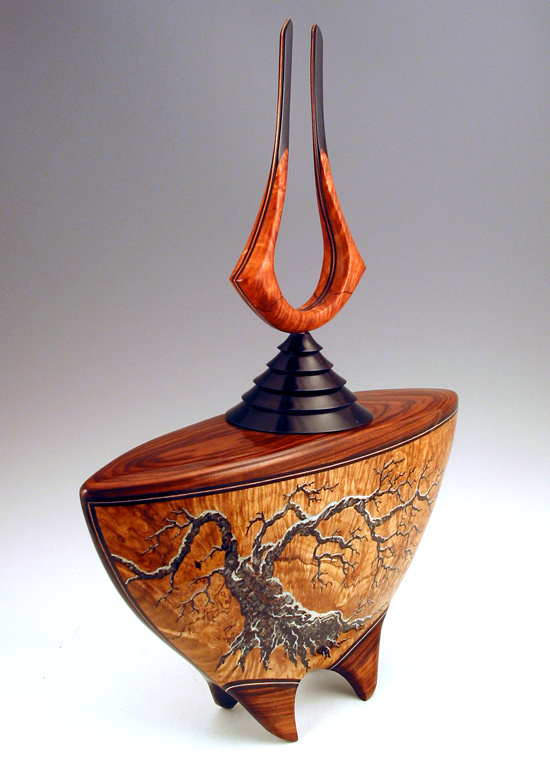 Finial of bigleaf maple, ebony, formed epoxy with interior rib of wood-fiber veneer for structural reinforcement. Mineral crystals inlaid with acrylic resin. Musical instrument lacquer finish. Comment: This piece is about the dynamic changes in life that occur in the mountains during early winter. Much life becomes dormant, as with the tree. At this same time elk enter a fevered period of mating allowing the start of new life. A gnarled tree dusted with snow is on the front of the piece. This image continues around the left side to the back where the last leaf of autumn remains. A scattering of shed leaves are inlaid on the back as well. The finial is a stylized elk horn. In Samurai culture, which celebrated the cycle of life, the snow covered tree is symbolic of strength through adversity and the elk horns symbolic of strength in combat. 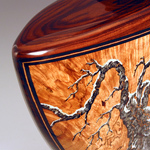 Exhibited at Out of the Box: The Art of Wood, Holter Museum of Art, Helena, MT.